Top 5 iMovie Alternatives for iPhone 6/6 Plus/5S/5C/5, etc. Still editing video files in iMovie on your Mac? With the increasing popularity of editing apps for mobile devices, you’re now able to get down to editing with your mobile device such as iPhone 6, iPhone 6 Plus, iPhone 5S, iPhone 5C, iPhone 5, etc and complete a masterpiece of your own! You can get iMovie app for free as long as your iDevice runs iOS 7 or later version. 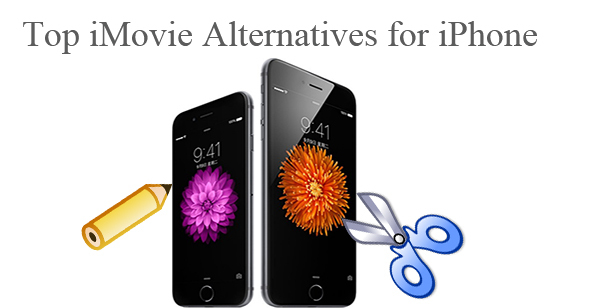 If your iDevice is too old to allow you to get iMovie for free, or you want to another video and music editing app to run on your iDevice, here are some alternatives to iMovies for iPhone 6, iPhone 6 Plus, iPhone 5S, iPhone 5C, iPhone 5, etc. With friendly user interface, Cute CUT allows you to drag and drop, create SD and HD movies, draw directly on movie with more than 30 drawing tools. Features like customizable transition, transparency, border, corner, shadow, transform, and sound volume are available in Cute CUT. You can export the movies created by Cute CUT to Camera Roll and share them to YouTube and Facebook. With Pinnacle Studio, you can access you media files easily from your iDevice, external devices, Box, Vimeo, Dropbox, Google Drive and SkyDrive. It allows you to navigate your project with intuitive gestures, arrange clips in the Storyboard swiftly, edit and trim in the timeline precisely, and replace one clip with another. And it can also create effects like slow motion and fast motion; create multi-layer 3D animations, transitions, and titles with Montage templates; create Picture-in-Picture effects; create soundtracks. After finishing editing, you can share the self-created videos with your friends via YouTube, Facebook, Box, etc, or transfer to Pinnacle Studio for PC.